How do I help my child become a faithful follower of Christ as an adult? It’s a question that is close to the heart of any Christian parent. Most parents know they have a part to play, and want to do their part, but don’t know what to do or how to start.There is no magic formula, but research, experience, and Scripture tell us there’s one thing you can do for your kids that makes all the difference: teach them to love God’s Word! 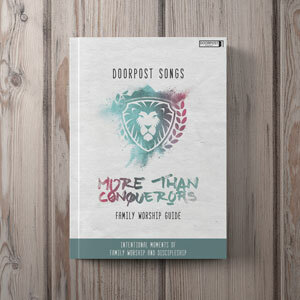 The More Than Conquerors Family Worship Guide is designed to help you do just that. 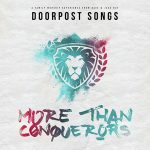 It contains 10 family worship moments to pair with the More Than Conquerors album of Scripture songs. All you need is fifteen minutes a week to create intentional moments of worship and discipleship with your family. (A Bible and a Doorpost Songs album wouldn’t hurt either!) Let’s see what happens when God’s Word becomes part of your family life.